IDPS-48-240-XT - DIN-Rail 48 VDC, 240Watt power supply with universal 85 to 264 VAC or 120-370 VDC input, -10 to 70C extended operating temperature. 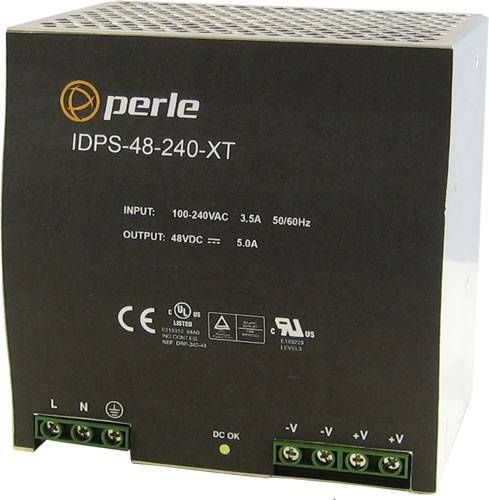 IDPS-48-240-XT DIN-Rail Power Supply. 48 VDC, 240Watt, with universal 85 to 264 VAC or 120-370 VDC input, -10 to 70C extended operating temperature. Perle Industrial-grade Power Supplies are designed to stand up to extreme temperatures, surges, vibrations, and shocks found in industrial automation, government, military, oil and gas, mining and outdoor applications. IDPS 24v and 48vDC power supplies are hardened to provide superior reliability in extended operating temperatures from -10 to 70C. For complete product details and technical specifications, please visit our DIN Rail Power Supplies Product Page.